Classroom Assessment Techniques (Cross & Angelo 1988, Angelo & Cross 1993). Designing Significant Learning Experiences (Fink 2003 and 2013). Collaborative Learning Techniques, (Barkley, Cross & Major 2005 and Barkley, Major & Cross 2014). Student Engagement Techniques, by Barkley (2010). 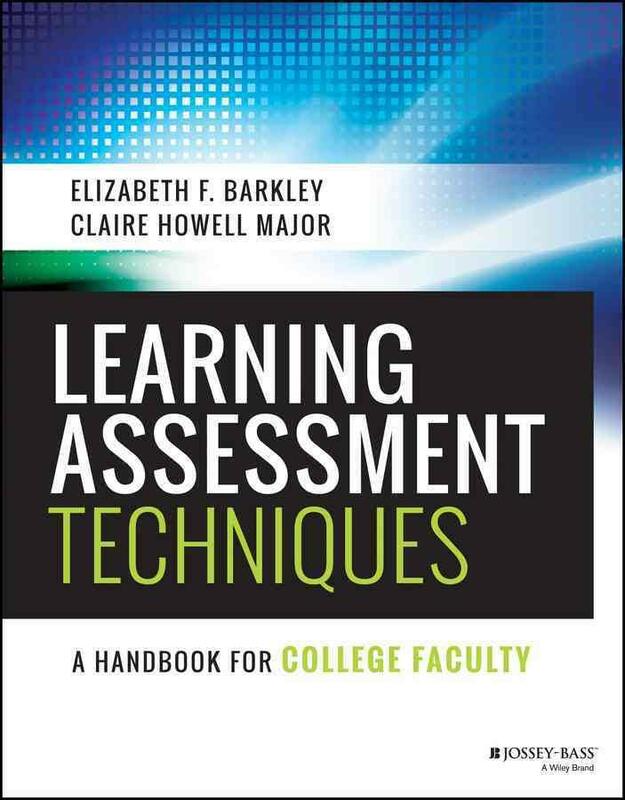 A recent addition to the list is Learning Assessment Techniques: A Handbook for College Faculty by Barkley and Manor (2016). The bulk of this book consists of an easy-to-use directory of assessment techniques, many of which can be found in the other books. Here, however, the emphasis is on how the data generated by each technique can be collected, analyzed, and packaged for dissemination. Why am I teaching what I’m teaching? How do I know whether my teaching is effective? Techniques are handily organized along the lines of the taxonomy used by Fink in Creating Significant Learning Experiences: foundational knowledge, application, integration, the human dimension, caring, and learning how to learn. It is this last meta-cognitive domain that I find the most interesting, and the authors’ presentation of possible variations and extensions for each of the assessment techniques presented in the book has already inspired me to slightly modify my knowledge plan and quality of failure assignments. For the first-day final technique, Barkley and Major suggest that the instructor incorporate student self-assessment by asking questions like “What are the strengths and challenges that you bring to this course?” In my prompt for the knowledge plan, I ask students to identify how their strengths and weaknesses might affect their ability to achieve their goals, but I don’t explicitly ask them to tell me what those strengths and weaknesses are. I also don’t ask why students have chosen the goals that they have chosen. Maybe I should. < Previous Why bother podcasting?